I am seriously honored that you would care enough to want to get to know me better. I'll do my best to give you a broad overview of who I am, but it would be much more fun to get to know each other over a coffee or glass of wine (depending on what side of noon, we're on). If you'd rather chat in person as well, feel free to contact me here. If you want to keep reading, enjoy! I'm Tony Wodarck. I am a husband, a father, a digital marketing director at Hurley (yes, dream job), a photographer, an aspiring chef and aspiring wine sommelier. In my free time (yes, kind of a joke) I also like to surf, travel, and hang out with my friends. I'm obsessed with coffee, pizza, wine, popcorn and new recipes. I began my passion for photography on film and eventually started shooting on digital as well. I now shoot a hybrid of both. You can read more about how my business began below. After having Sicily and moving with my wife to San Juan Capistrano, I've realized the importance of our local community. This has led me to give back to my favorite local charities. 25% of the profits I make from photography gets donated in your name to the charity of your choice. I have one organization I love and recommend, The Ecology Center, which teaches people how to live a sustainable lifestyle. You can read all about that below. I love connecting with new people and sharing in huge milestones. If you are looking for a photographer for your big day, your wild elopement, or your steamy couples' session, whatever it may be, hit me up here. I look forward to working with you. Please hit the button below to get in touch. During my senior year of high school I was able to take one elective class; I randomly chose photography. Unbeknownst to me it would project me on a lifelong passion through all sorts of places. The first day of class the professor tried to weed out the kids looking for an easy class. He stressed the fact there will be weekly quizzes, tough creative review and we will learn the fundamentals of photography like a proper college-level class. It didn’t discourage me because I’m always up for a challenge. I should clarify that we were learning on film cameras. This was right before the boom of digital cameras. It was a great way to learn the ins & outs of photography through it’s original form. I borrowed my Dad’s Canon AE-1, 35mm film camera that he bought on my Mom and Dad’s honeymoon to document their trip. I still have that camera and shoot with it to this day. Through the course of the semester I fell in love with shooting film, hanging out in the darkroom, enlarging prints and really got excited about the entire process. My photos were terrible, but I was having fun. I decided to take another semester of the class and was able to really round out my foundational knowledge of photography. This was happening all during the time that digital cameras were beginning to explode. They were crap and they were expensive, but you could shoot photos and upload them to your computer immediately. A huge benefit in time and cost. My parents bought me a 2 megapixel camera for my graduation gift. It sent me on a journey of shooting over 1 million photos in the past 15+ years and led me on adventures around the world through Semester At Sea and my own personal travels. I kept my photography purely as a hobby sticking to travel photojournalism. Documenting my time in places, typically void of people in photos. Focusing more on landscapes and details of the environments I encountered. It wasn’t until 2016 that everything changed. 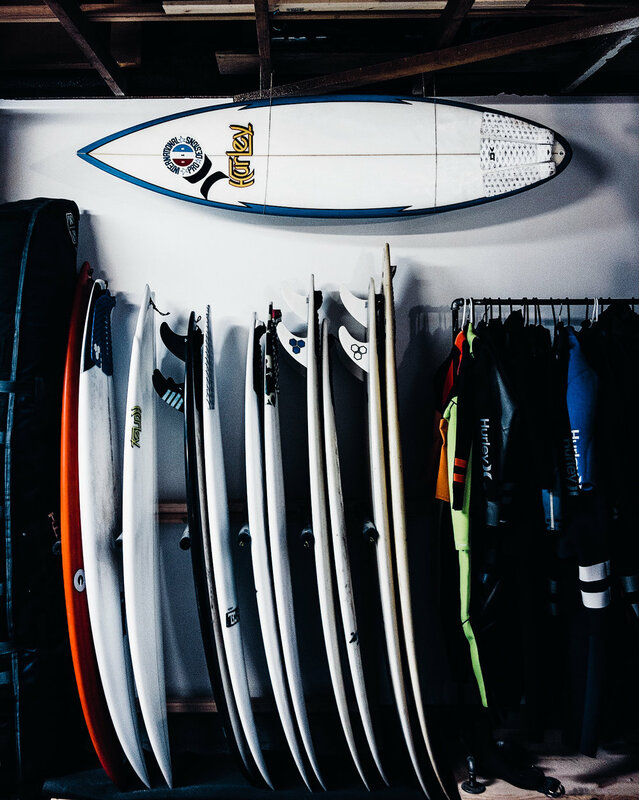 I found myself in a growing side-hustle of selling friends' surfboards on Craigslist. There seemed to be a never-ending supply of boards from my coworkers at Hurley. I was able to sell over $10K in boards in 2016. Instead of taking that money and buying random stuff, I decided I would make the leap and buy a professional-grade camera. I could never justify the spend before as photography had always been a hobby. But now, flush with extra cash, I decided this was finally the time I could do it. As soon as I bought the camera I started to get requests to shoot family portraits and a few friends’ weddings. I was not ready for such a huge leap, but I said yes anyways. I did a great job, especially considering the price I charged, but there was a lot of room for improvement. I decided I needed to start second shooting with some real portrait/wedding photographers to learn the ropes. I got lucky enough to photograph alongside our own wedding photographer, Kimberly Daniels during a couple weddings. Through watching her work I was able to see the proper flow to a wedding, the importance of following a timeline, scouting locations, preparing for family photos, where to be during different times of the day, etc. etc. It was an incredible class in itself. I decided with this new equipment and rapid-growing passion to photograph people, it was time to actually put myself out there. I created a website and told my friends and family on social media, I was open for business. The opportunities flooded in and the business snowballed in to where it is today. I’ve made incredible new friends and shared the best days of their life alongside them. I also have made a ton of great friends in other photographers in our community too. I would never have expected to be welcomed in to such an uplifting community who believe in the idea of “community over competition”. It’s incredible. Because of the growth in my business it’s allowed my wife to quit her full-time job and made it so she can stay home with our two beautiful children, Roman and Sicily. It’s all something I could have never imagined coming from a darkroom my senior year, but here we are. I can’t wait to update this story in fifteen more years and see where this camera takes me. Enough about me, let's chat!